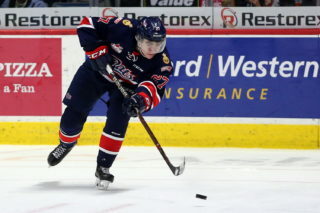 The Regina Pats (1-1) wrap up the round robin at the historic 100th Mastercard Memorial Cup on Wednesday night against the WHL Champion Swift Current Broncos (0-2). Puck drop is at 8 p.m. at the Brandt Centre. 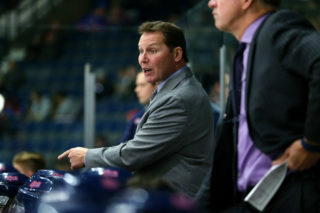 The Pats are coming off an 8-6 loss to the Acadie-Bathurst Titan on Sunday while Swift Current fell 2-1 to the OHL Champion Hamilton Bulldogs on Monday night. The game can be heard starting at 7:05 with the Safeway Sobeys pre-game show followed by Bennett Dunlop Ford Pats Hockey on 620 CKRM. The game will also be broadcast on Sportsnet. May 23, 2018 Swift Current Regina 8 p.m.
May 24, 2018 Tie-breaker TBD TBD 6 p.m.
May 25, 2018 Semi-Final TBD TBD 8 p.m.
May 27, 2018 Final TBD TBD 5 p.m. 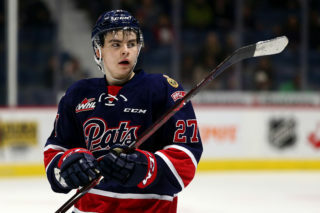 The Regina Pats dropped their first game of the 2018 Mastercard Memorial Cup on Sunday, 8-6 at the hands of the Acadie-Bathurst Titan. Regina got off to a good start with a goal 13 seconds in to the first period off the stick of Cameron Hebig to lead 1-0. However the Titan used a 1:22 stretch to score three times after that and led 3-1 at the break. The second period was more of the same with Acadie-Bathurst scoring three times and Regina got one from Jared Legien, his first and it was 6-2 after two. In the third, the Titan extended their lead to 7-2 early but the Pats started to fight back after that. Cameron Hebig (2), Nick Henry (2), Josh Mahura (2) and Matt Bradley (1) all scored and the Pats got to within a goal at 7-6 with 1:57 left. The Pats were unable to find the tying goal in the final minutes and the Titan scored an empty netter with a second left on the clock to win 8-6. Sam Steel led Regina with a four assist game while Cameron Hebig had three points and Max Paddock and Ryan Kubic combined to make 29 saves. Pats captain Sam Steel is off to a great start at the 2018 Mastercard Memorial Cup. The signed first round pick of the Anaheim Ducks scored a goal and had an assist in Regina’s 3-2 win over Hamilton on opening night Friday. He followed that up with a four assist night against Acadie-Bathurst on Sunday in an 8-6 loss. 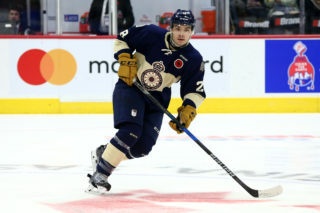 Steel’s six points is third among all skaters at the Memorial Cup. Acadie-Bathurst captain Jefferey Viel leads the way nine points while defenceman Noah Dobson has seven points in three games played. Despite there being just one game left in the round robin at the Mastercard Memorial Cup, there is a lot left to be decided when it comes to the standings and who will be playing when as we head into the final weekend of the tournament. 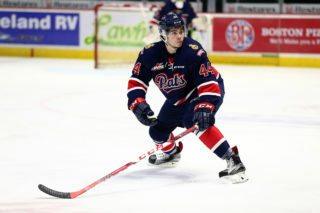 Should the Pats win tonight over Swift Current, Acadie-Bathurst would go straight into Sunday’s final as they have the tie-breaker over Regina and Hamilton who would all finish the round robin and two and one. Should the Broncos win tonight, Hamilton would be through to the championship final, Acadie-Bathurst would be into Friday’s semi-final and the Pats and Broncos would meet again on Thursday at 6 p.m. in a tie-breaker game.